Tottenham defender Toby Alderweireld is set to be confirmed as a Manchester United player within just 48 hours in a deal worth around £60m, according to the Mirror. Jose Mourinho has been chasing the 29-year-old defender all summer and now looks to have landed his prime target after a breakthrough in negotiations in which a fee for the player was eventually agreed. 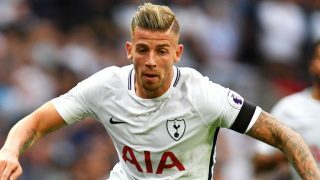 It is understood that Alderweireld was prepared to run down the final year of his contract at Spurs, with his heart set on a switch to Old Trafford next year. However, a deal has now finally been agreed with the North London club accepting a fee below their initial £75m asking price. The impending transfer of Alderweireld will come as a huge boost to United manager Mourinho, who has become increasingly frustrated at the club for not being able to secure his transfer targets. The Belgian defender will bring real quality to United’s backline with his confidence in playing out of the back and ability to read the game. It also represents a significant coup for United, who are buying from a direct Premier League rival, who in Daniel Levy, have a notoriously tough negotiator. Toby Alderweireld will join Fred, Diogo Dalot and Lee Grant as United’s summer signings.